Habitat productivity and vegetation biomass are important factors affecting species diversity and ecosystem function, but factors determining productivity are still insufficiently known, especially in the forest herb layer. These factors are difficult to identify because different methods often yield different results. We sampled the herb layer biomass and assessed soil nutrients, moisture and light availability in 100 m2 plots in Czech oak forests. 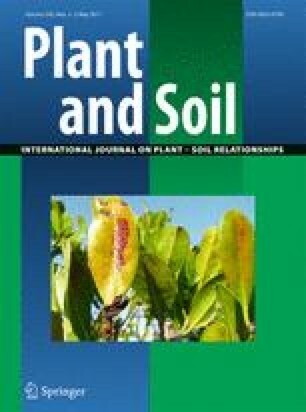 Habitat productivity was estimated independently from nutrient content in the soil, herb layer biomass and using a bioassay experiment (growing phytometer plants of Raphanus sativus under standardised conditions in soil samples taken from forest plots). The generalised linear model for herb layer biomass showed it to increase with light, soil phosphorus and moisture availability, but only 10.7% of its variation was explained by these factors. The phytometer biomass increased mainly with soil pH and phosphorus availability; together with soil C/N ratio these factors explained 56.1% of the phytometer biomass variability. Combined evidence based on different approaches indicates that canopy shading and soil phosphorus tend to be the most important factors influencing the herb layer productivity of the studied oak forests. Responsible Editor: Harry Olde Venterink. We thank the staff of the Botanical Garden of the Faculty of Science, Masaryk University, for providing greenhouse space for the phytometer experiment and to Marie Vymazalová for her technical help with the phytometer experiment. We are also grateful to Michal Hájek, Zdeňka Lososová, Zuzana Rozbrojová, and Lubomír Tichý and two anonymous referees for their comments and suggestions on this manuscript. This study was funded by the Ministry of Education of the Czech Republic (MSM0021622416) and the Czech Science Foundation (526/09/H025).